The Mommessin wine company has been around since the arc. Too out of fashion even for your parents. But let me tell you what I discovered over the Holidays. Everyone loves Mommessin . . . but they don’t know it. The wines are much improved and ready to satisfy many people’s interest in light, lively reds. 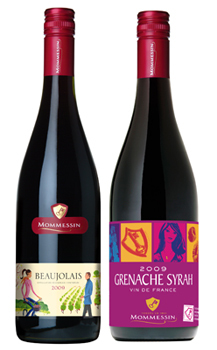 Mommessin Beaujolais Nouveau was a big a hit with the Christmas bird, the regular Beaujolais was gulped with glee at our other Holiday events, and new arrival, Mommessin Grenache-Syrah got rave comments at a chicken dinner. Maybe everyone was over consuming and welcomed the light ‘n refreshing nature of these wines (served lightly chilled), but I think there are lots of Beaujolais fans out there that need to come out of the closet and state their love. Mommessin’s Grenache/Syrah is classic French café wine – a ‘gulp-me’ refresher. You’re sure to need a second bottle. Shades of Cotes-du-Rhone. Good with any food, great with people. The new label on Mommessin 09 Beaujolais says it all – lighten-up. The Nouveau is sold out. Invite some fun into your drinking with Mommessin.